Winifred Madeline Gould was the seventh child and second surviving daughter of Nat Gould and his wife Elizabeth. She was born on the 13 March 1902 at Bedfont in Middlesex. In the 1911 Census she was at boarding school in Margate. 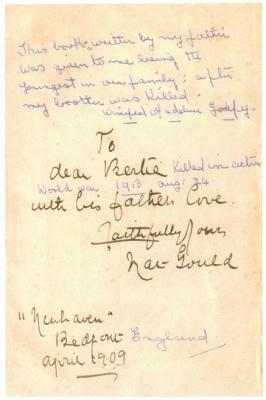 The copy of his autobiography The Magic of Sport which Nat Gould had presented to his son Herbert Ruska Gould upon its publication in 1909 was passed on to Winifred Madeline Gould after her brother was tragically killed in action just before the end of the First World War. "This book written by my father was given to me being the youngest in our family after my brother was killed". She had been very fond of her big brother. In the family portrait taken at Newhaven in 1908 she is close beside him. After Herbert's tragic death, the book was given to her as the youngest surviving child. She would have been expected to live furthest into the future, as indeed she did. 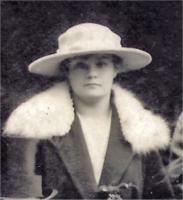 In 1924 Winifred Madeline Gould emigrated to Australia. In that year her elder sister Doris, who had gone to live in Australia following her marriage to Francis Albert Marryat in 1918, visited England with her two young children Frank Marryat and Betty Marryat. 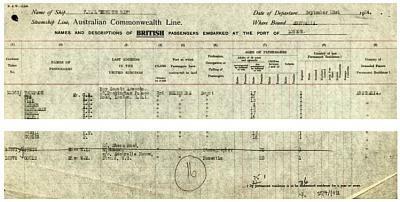 On their return home Winifred went with them, travelling third class on the Australian Commonwealth Liner TSS Moreton Bay. They sailed from London for Melbourne on 23 September 1924, Winifred giving her “Last Address in the United Kingdom” as being c/o Australia House, Strand, London. She was aged 22. 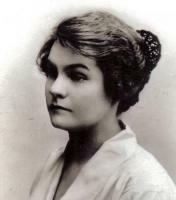 Although Doris was by then settled in Canberra, Winifred Gould went to live in Brighton, Victoria. Many years later she told her granddaughter that both she and Doris emigrated to Australia to "start a new life" away from their parents. In Australia Winifred met and married London-born Charles Robert Arthur Godfrey in 1927. In 1931 Winifred Madeline Godfrey and her husband were living at Station Road in Tooradin in the Flinders District of Victoria, Charles Godfrey being then recorded as a farmer. By 1936 they had moved to 7 Agnew Street in Brighton, Victoria. Charles Godfrey was then recorded as a metal worker, and later became a builder. Charles and Winifred Godfrey had three children: Jeannette Godrey (born 22 November 1930 and died 28 July 2004 at Traralgon in Victoria), William Godfrey (born 30 May 1933 and died 1989), and Nathaniel Godfrey (born 18 March 1944 and died 3 June 1998). Winifred Madeline Godfrey died on 16 September 1988 at Rosebud, Victoria, her husband having predeceased her on 14 October 1955 at Brighton. She was buried at Rye Cemetery in Victoria. (1) Information about Winifred Madeline Gould on this page is mostly from personal recollections and documents kindly supplied by her granddaughter Glenda White. (2) With them, by coincidence, sailed a contingent of Australian Boy Scouts homeward bound from the Imperial Scout Jamboree which had been held at Wembley during the British Empire Exhibition. Other scouts went on to the International Scout Jamboree which was held in Denmark immediately following the Wembley meeting.